Welcome the Sheffield Egg with a happy fork – try it today! With its Sheff'licious ingredients, our Sheffield Egg couldn’t get any more parochial. Cindz jam sandwiches, homemade dips and fruity Pimm’s. Plus, there is no chance of setting fire to anyone or dying of food-poisoning (half-cooked meats in a roll? Ewwwww!). Plus, one of the key things to a good picnic is to buy good quality food and this summer we’re going to see the arrival of a new tasty ready-to-eat snack, named The Sheffield Egg. Scotch eggs are definitely an old favourite for a lot of people, especially up north. All my life I thought I hated Scotch Eggs, but of course I’d never really had a good one. The ones I grew up on were budget efforts that would split in about ten different directions with the egg crumbling and the soggy meat falling apart. 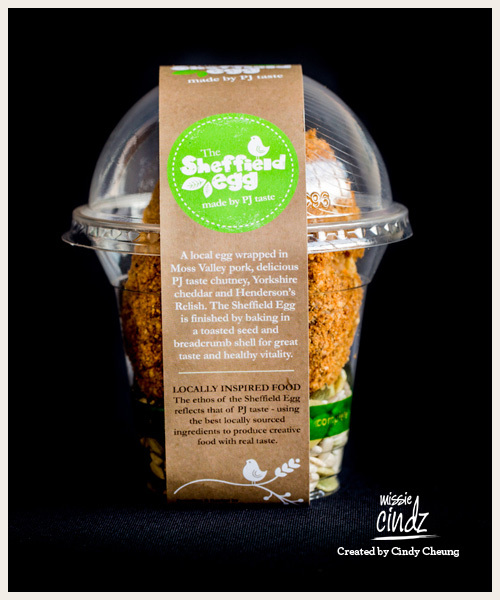 The Sheffield Egg — baked, not fried — is a fantastic idea developed by a partnership of Sheffield-based food producers and when Peter Moulam of PJ taste contacted me back in January asking for my help in the egg’s new brand identity and packaging – I didn’t hesitate to say yes! The Sheffield Egg was officially launched last Wednesday (18th April) at PJ taste by the Lord Mayor of Sheffield, Dr Sylvia Dunkley. The egg was born after 17 year old Michael Dungworth, a student of the Peter Jones Enterprise Academy went on a 3 week work placement at PJ taste. 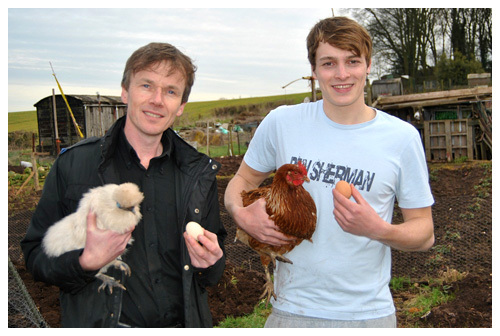 Michael informed Peter of his interest in food and how he owned several ex-battery farmed hens and more unusual breeds, such as Silkies, Dorkings and a Copper Maran – I’ve seen photos of Michael’s chickens and they’re not chicks you’d like to mess around with! :) Michael also tells me he keeps around 26 birds each producing around 300 eggs a year! You can obviously tell Michael is a budding entrepreneur – a smart lad with the determination to one day produce his own food and that’s how the Sheffield Egg was born. It’s a great concept in showcasing Michael’s Sheffield laid eggs in an interesting (and delicious) way. I liaised closely with both of them to gain a good understanding of the egg’s background and the reasons behind it – making sure the new identity communicated the optimism and the sense of place that PJ Taste and Michael were looking for. Our city’s wholesome egg uses a Ploughman’s-style covering using the best locally sourced ingredients – fusing the ex-battery farmed chicken egg with pork from Povey Farm in Sheffield’s Moss Valley combined with good ol’ Henderson’s Relish (providing the distinctive Sheffield tang), PJ taste chutney and Yorkshire cheddar cheese, plus, the egg is baked rather than deep fried – as you can tell, our Sheffield Egg couldn’t get any more parochial. The Sheffield Egg is now available at PJ taste on Glossop Road for around £2.50. It is packaged in a compostable container (made from corn) on a bed of pumpkin seeds, with a kraft-like label to reflect the egg’s natural honest and ‘no nasties’ ethos. I felt it was important to provide visibility of the egg to the consumer – to show it’s artisan handmade and ready-to-eat appearance. 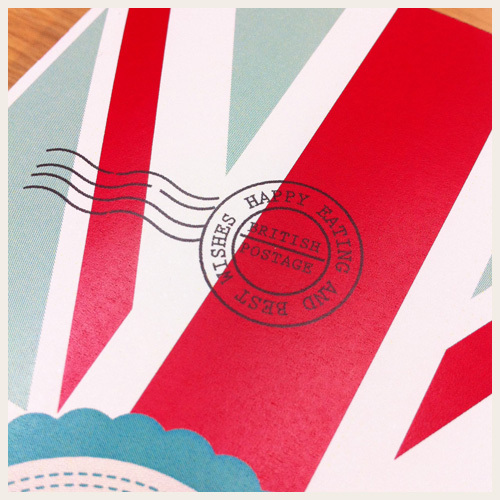 It was also important that the packaging still conveyed great taste and wholesome natural ingredients. So go on, take a Sheffield Egg with you on a picnic and off to the nearest pleasant park you go. There needn’t be a supermarket Scotch egg in sight!